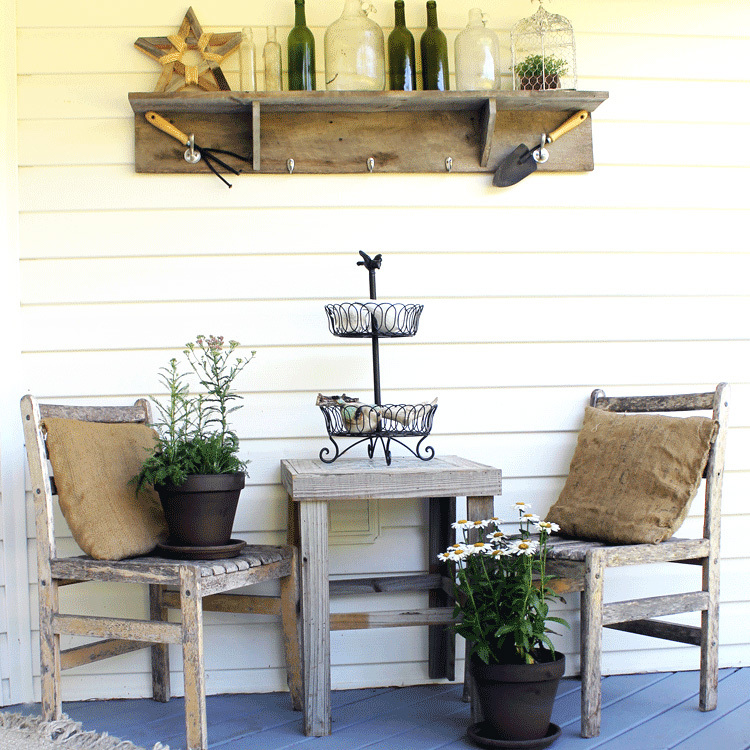 Create a rustic and summer front porch with just a few simple items. You’ll find a little rust, new, and lots of plant life. Let me show you how! Well, hello my lovelies! I finally was able to get going on my summer front porch decorating, and it feels great to finally have it all in place. It was been absolute craziness though because this past week was so hot that I had to stop a few times to go inside for a water break! Then, at one point I had to finish up at night because my brand new plants were already starting to keel over. No good! How are you liking my new deck color? I was a little leery at first when selecting this color, but now… I love it! Did you see my post on how to update your deck? 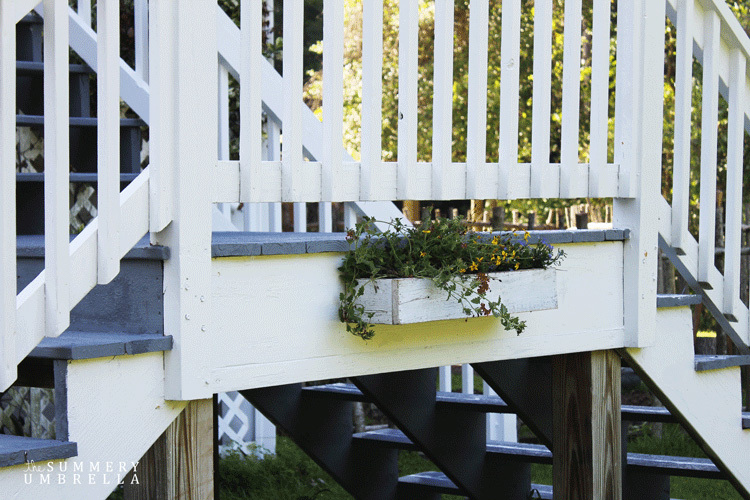 If you ever plan on doing this on your own deck it’s a definite must read! This planter box was a last minute idea, and I’m so happy with how well it turned out. Eventually I’ll be adding lattice underneath to hide any eye sores, but for now, the planter box helps tremendously. I wanted to keep this deck as simple as possible, but let me tell you. I always have a hundred ideas, and I have to remind myself that not all of them can be used at the same time! 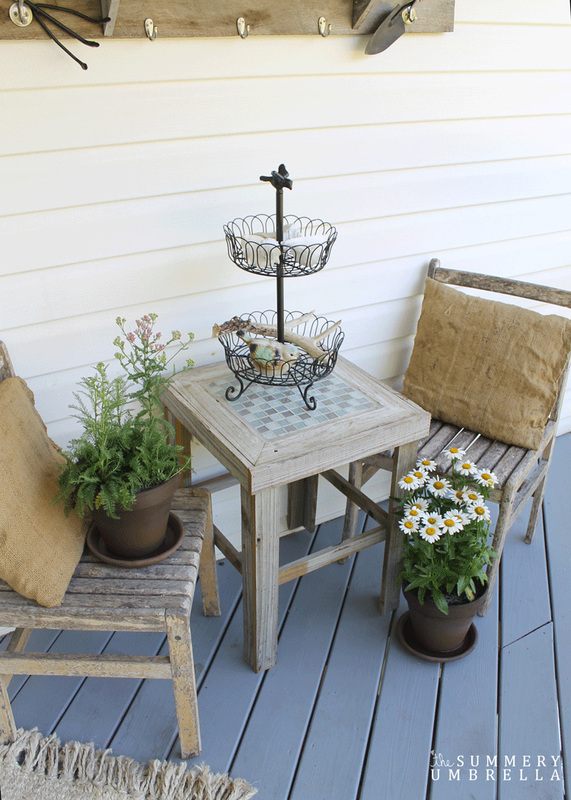 One of my favorite accessories for this porch are my no sew burlap pillows. Aren’t they just the cutest things around? Wanna know a little secret? You know what I love about potted plants? 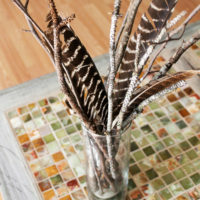 When it gets too hot you can bring them in, or when you need a little bright and cheery in your own home you can use them for a pop of color on your table. They are just so versatile, and I’ve learned over the years that if I stick with neutral colors for the pots I can consistently move them into any space and they’ll work out just fine! You know I couldn’t resist sticking a deer antler into my decor ;) They are just so beautiful, natural and full of gorgeous character. It’s funny. Once you start telling people what you like to do (ie. 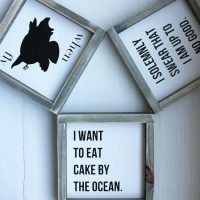 blogging, decorating, repurposing) friends and family will naturally become more aware of items that will fit into your hobbies. For instance, these gorgeous bottles below were found in a old field, and one of our friends decided to pick up some of them for me. Isn’t that sweet?! Thank you, thank you, thank you!! 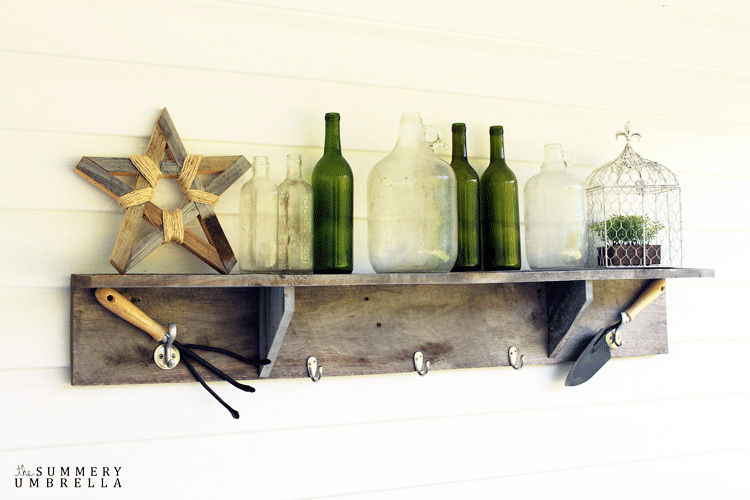 :) I’m such a big fan of repurposing items, and definitely love how they all look like new treasures when placed in a different environment. Your porch looks great. I love how you reused a lot of older items too. Very lovely porch. I never thought a brown pot could look good, but yours are stunning — so soft looking! What a great place to enjoy a cup of coffee or tea. Your front porch is so pretty! 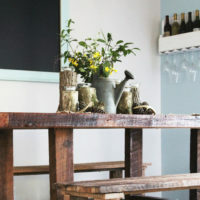 I LOVE the vintage bottles and your table is gorgeous! Thank you so much for sharing at The Wonderful Wednesday Blog Hop! Hi, LZ ~ Your porch looks beautiful! I love all of the natural elements and rustic details! And I love the color!! Thanks for sharing! omg, I am in LOVE with the wooden star on your amazing shelf. Such a beautiful porch! You know what? That star actually started off on top of my Christmas tree last year! Crazy, right? Love it’s ability to go anywhere! I love your summer porch, it just looks beautiful and I love all the vintage touches. Your front porch is lovely. I could sit there for hours! Thanks for linking up at Idea Box! 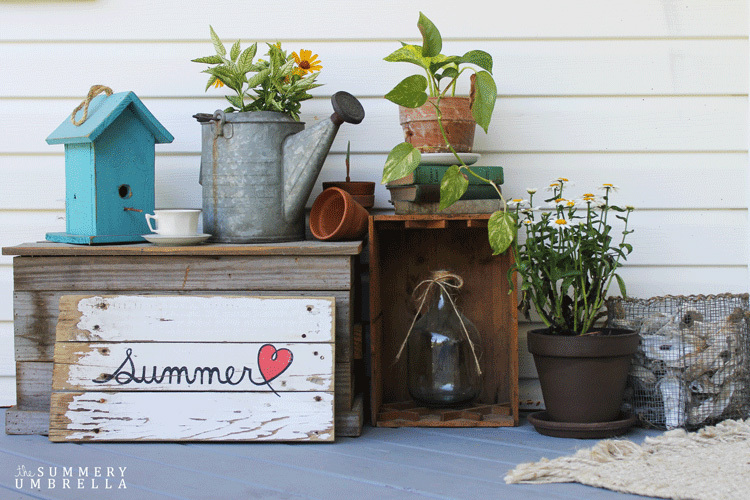 Your porch looks so cozy and happy for summer! Love the display with the pots, books, and watering can. I’m including you in my features tomorrow at Your Turn to Shine. Thanks so much for sharing your lovely work with us! 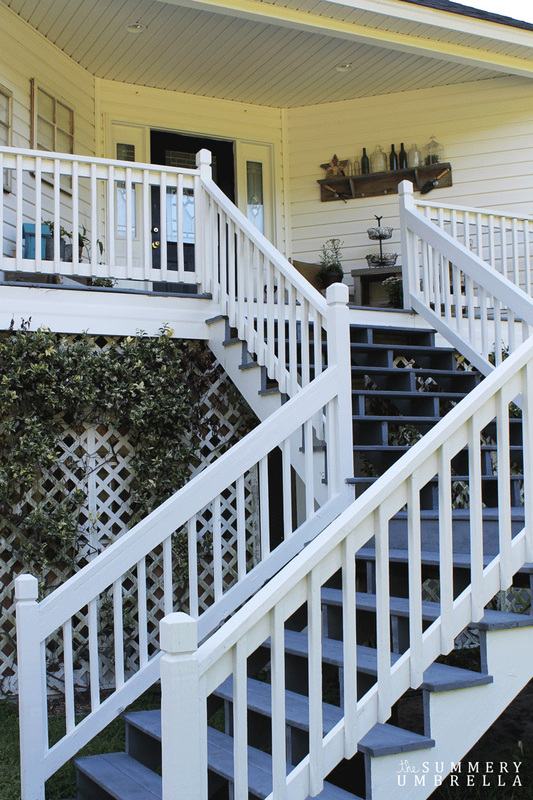 Love what you’ve done to your front porch, it looks great!